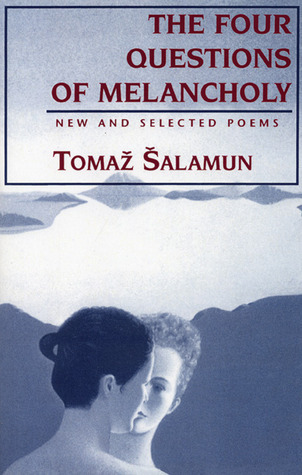 The Four Questions of Melancholy by Tomaz Salamun, an anthology of his poems that goes all the way back to Poker. There are certain books I can open up and read whatever I open to and have shown to me something perfect. This book is one such example. I love this book because there isn’t a bad poem in it. It’s not a very sophisticated love. When I was 20 I was obsessed with great American and European male fiction writers of the 19th and 20th century, and I thought I would become one for the 21st century. I wrote some awful stuff and showed it to my independent studies professor, Dara Wier. She told me to go to this reading at Memorial Hall at UMass by a Slovene poet. It’s sufficient to say that Tomaz (and Dara) thoroughly altered my thinking about writing. I took his book home and read it all the way through with his haunting accent in my head. Then I wrote a poem. It wasn’t good, but it was the first time I was aware of what the process of writing a poem could feel like. I want to say that if it weren’t for The Four Questions of Melancholy I wouldn’t be writing poems today. Who can say if that’s true or not, but whenever I’m in a non-writing funk, this book gets me out of it. Tomaz’s poetry exemplifies the truest expression of freedom and the authority to seize it. He’s a total freak that way and an enabler. When I read this book I’m invited to ruin language the way he does which makes me feel good about being a human. The entire poem is 36 lines, and it does all the above things except disgusts me. I should send this book to my grandparents Warren and Rosalie with the hope they’ll understand my own work a little better. Bio: Luke Bloomfield is the author of a chapbook called The Duffel Bag (Factory Hollow Press, 2011) and a longer collection called Russian Novels (FHP, 2014). He earned an MFA from UMass, and he supports all Massachusetts sports teams. This entry was posted in Safety Book and tagged luke bloomfield, russion novels, the four questions of melancholy. Bookmark the permalink.